Your salon reception desk is one of the most crucial pieces of furniture because it is the first impression a customer has of your business. The reception area is not just for your customers, but also for you and your employees. If your employees, especially your receptionist, feel good about the furnishings of your salon, their happiness and pride will spread to your customers. First impressions matter especially in a retail business. Your entrance area can either persuade customers to enter or discourage them into turning away. Some things you can do to assure customers want to enter your salon are to make the entrance and reception area inviting. To achieve an attractive entrance, make sure the floors are clean, glass doors sparkle, trash receptacles are regularly emptied, and the area is free from clutter. To help you set the overall ambiance and theme of your salon, you need to select the kind of reception desk that best conveys what you want customers to feel and think about your salon. It's vital that you choose a desk that helps accentuate your salon's design to further inspire confidence in your customers. You want them to know that your salon practices and services are industry up-to-date with the latest hair styles and products. You need your customers to believe your salon can meet their expectations and know they are dealing with top-notch professionals. While it may seem impossible that one piece of furniture can make or break such an impression, if the reception area is neglected customers will come away feeling as though they've not been properly greeted. A customer expects a reception area at a salon, just like at a doctor's office or a spa; this immediately lets a customer know where to go. If a customer must look around your salon to find someone to help them, they will feel neglected and that their business is unimportant to you. Think about times when you've had similar feelings. Try to remember how the décor was set up and what the reception area looked like. The first step to designing your reception area is to decide what message you want to convey to your customers the moment they step through the front doors of your salon. Do you cater to a young clientele or are do you service all ages? Is your salon strictly for women or do you also style men's hair? What about children? Do you style children's hair? Do you wish for your salon to be viewed as cosmopolitan or are you more of the rural local salon? These are all things you need to consider before selecting your perfect reception station. If the majority of your clients are children and their parents, then you need to accommodate the difference in heights in your customer ledge design. If your salon is modern and designed with contemporary furniture, you'll want to select a modern reception desk to match your existing interior design. If you're designing a new salon, be sure to do research on the latest furniture styles. Customers will appreciate your attention to detail. Your reception desk should provide ample space for employees to work. 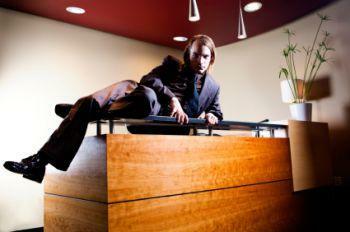 There are several key components you want to be sure your reception desk has. It's easy to be overwhelmed when designing a business space. You have so many decisions to make and most salon owners are working on a tight budget as well as a looming deadline. Make sure you take your time in selecting your furniture, especially your reception desk. You want to be sure that your customers have plenty of space to place a purse and any product being purchased on the reception service ledge. The ledge height should be above your work space and high enough that customers aren't looking down onto your receptionist's work space. Once you've considered all of the design options available you'll have a better idea of the kind of salon reception desk you want for your salon.